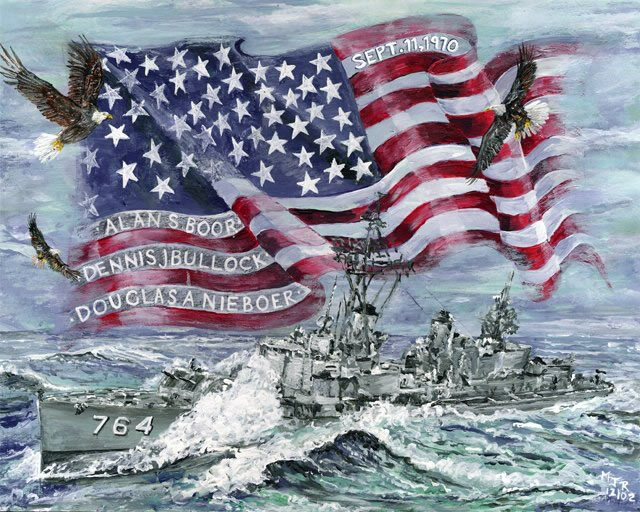 Destroyers were stationed along the coast of Vietnam to provide artillery support to ground troops. Targets could be trucks, tanks, boats, bunkers, or enemy personnel. The Thomas could use one or both of her two twin gun mounts located fore and aft on the ship. These guns could fire a five inch high-explosive projectile nine to twelve miles inland. Occasionally, one of the guns would fail to fire normally, and the powder casing and the projectile would remain in the barrel. After several unsuccessful attempts to fire the gun using auxilliary firing methods, the "hot gun" would have to be cooled by flooding the barrel with water. This was to prevent the heat from previous firings from detonating the high explosive charge in the projectile (bullet) remaining in the gun barrel. 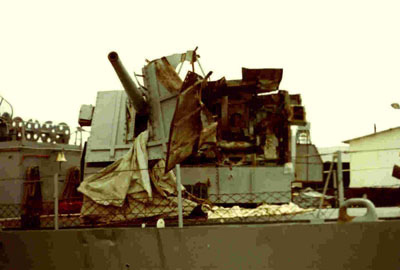 During the 1970 WestPac cruise, the Thomas suffered an explosion in her forward gun mount not from a "hot gun" as such but from bad ammo. The problem was that the projectile was pretty old (Korean War vintage) and was designed for a particular powder, either flashless or non-flashless. The flashless powder would be used during the day as the burst of fire from shelling would not be seen during the daylight. The non-flashless powder would create smoke instead of a fire burst and would be used at night to prevent detection. The powder the Lloyd Thomas was using this day was a new smokeless, flashless formula that burned faster. It overstressed the projectile and blew the base fuse up into the High Explosive charge. That in turn ruptured the barrel and vented the force of the powder and the HE into the mount. I was in CIC (Combat Information Center) when the mount blew. It felt so violent, so loud and so terribly different than the other thousand or so rounds we had fired. We all stopped what we were doing and looked at each other for a second. We figured we had taken an incoming round. When the barrel blew off, it departed the ship going end over end, about 200 yards out. It clanged the side of the hull pretty good as it left. You can see the dent it left in the photo of the damage. Well, we heard that clang right after the blast, and figured we were headed for the bottom. Immediately, we went to full GQ (General Quarters), secured all doors and shut off the vents. For the next four hours or so, we sweltered in that room with very little info coming in and none going out. Rumors were flowing like water over the sound-powered phone net. Finally, after what seemed like an eternity, we secured. The bow was roped off forward of the superstructure. I stood on the O1 level (1st level above the main deck) and looked at the wreckage. By now, of course, we knew that Dennis, Al, and Doug were dead and that the rest of the guys were badly injured. A bunch of helos flew out from Vung Tau and carried off the wounded. I saw one body bag being carried aft. It might have been empty, or filled with water, from the flaccid look of it. Certainly not a body. But that's exactly what it contained. Later, I watched a sailor with a fire hose washing down the deck. I was standing on the O2 level and watched that red foamy water run out the port scuppers into the sea. That vision is as fresh now as I write this as it was in 1970, nearly 30 years ago.Dennis was a big, tall farm kid from Montoursville, PA. 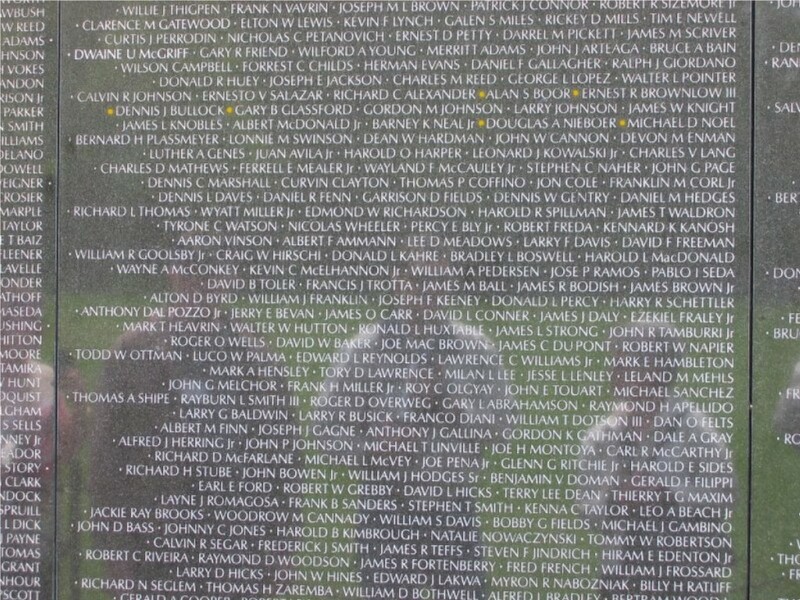 It's the same town as all those students came from who died on the TWA flight a couple of years ago. He was older than us; about 24. Gosh, that seemed old then. Not anymore, though. He and I were good friends. Back in Pearl, he had a Honda 350 motorcycle that I used to rent from him. He was always broke, and I liked riding motorcycles. Seemed like a natural deal. He was a real nice guy. Mt 51 was removed and a round steel plate was bolted over the hole. We went back to Viet Nam and spent a short time on the gunline, but mostly did plane guarding or NSAR. Meanwhile, the Navy was scrounging parts from every disaster in the 7th Fleet for the past several years, and cobbled a "new" mount together in Yokosuka, Japan. We went there in December and had the new mount installed. Interestingly, it was made up of parts from our original mount, as well as parts from the USS Frank E. Evans, the DD that was cut in half by an Australian carrier a few years prior. The events of September 11, 1970 will live in the minds of the crew of the Lloyd Thomas and their families forever. My purpose for writing this is let anyone who reads this know that I want to pay honor and respect to those who died or were injured in the gun mount explosion. I also want people to know of the distinguished meritorious service performed by the crew of the Lloyd Thomas not only on that day , but during the complete tour of duty. I was a Shipfitter 2nd class and had served aboard the LT since December of 1967. The following is what I recall of that day. A lot happened that day. Some of it is unclear to my memory for we were reacting to our trained instincts to control damage and secure the ship. We had been on the gun line for about a week and had become accustomed to the gun mounts firing around the clock. That day we were firing from the forward gun mount. I had just came from the mess hall and was sitting down to write my wife a letter. I heard the explosion and knew immediately that something was wrong. The sound and the way that the ship shook was so abnormal. I threw down my writing paper and was out of the aft hatch just as general quarters sounded. I was running forward to my GQ (General Quarters) station which was Repair Party 1; I was a firefighter. As I came around the starboard side watertight door near our mail room, the black smoke and what appeared to be debris was blocking my view of the bow. My thoughts at that moment were that we had been hit by enemy fire. I turned to go inside to make my way forward via the passageway, but everyone was running to get to their GQ assignments. So I turned and ran up the starboard side of the main deck toward the gun mount. I was just aft of the stairwell that came up from the scullery when I passed one of the crew from the gun mount. He was blackened, dazed, and visibly injured. I do not even remember who he was, but his face will always be etched in my mind. At that same moment I could see the gun mount. With others near mid ships I proceeded onto the mount. DC 3rd class George Bischoff and I arrived about the same time and grabbed the hose with the extension on it that lay charged for hang fires. We stuck it in the remaining barrel and turned it on. I then told George I would get on my OBA (Oxygen Breathing Apparatus) and go below decks to control any fire or damage there. Our repair party electrician, I'm not sure if it was Ragsdale or Laird, arrived. I instructed him to secure the power, which he went to do. We then grabbed the hose from behind the chief's mess table and charged it. I checked the watertight door into the merry go round for heat. None was present but the door was distorted. I opened the door and entered, discovering only projectiles and shell casings strewed about, some bent and damaged from the explosion. I felt that the possibility of another explosion could happen at any moment with all the wires and fluids raining down on me. I had our COM person request from damage control permission to scuttle the ammunition, which they did. I picked up the worst ones first and carried them topside and threw them overboard.While this was going on George and others were removing the casualties. Helos were coming in to take them to a MASH unit. Others were reassigned to assist our repair party. Some helped form a line to get the remaining ammunition out whiles other assisted George's group. My fears were heightened when I picked up one projectile. The white letters WP stared me in the face. I knew this was white phosphorus and carried it topside myself. The next one they took from me, for we were a team and knew all too well what needed to get done. Near the end of the removal GM 1st class Pomerleu came up to assess the site, for his knowledge of ammo was far greater than ours. Once all the ammo had been scuttled and the area was secure we went down in the chief berthing quarters to check the magazine area below. No visible damage was evident. As I came topside finally to assist there, all was done except securing and cleaning up. When this was complete, I recall looking up to the 01 level where some of our shipmates were standing to see the damage. I was still in my OBA and was covered in fluids. One of them looked at me and said " I don't know how you guys did what you did, but Thanks." This meant a lot to me. I recall turning and looking out over the waters trying to comprehend what had taken place. I saw a Russian trawler off in the distance, dogging us to assess our damage. It was not unusual to see them, but that day they were not around until the explosion. We left our station and returned to Subic. On our way that evening we received mail, our first since leaving Pearl. Not long after lights out that night, we went to GQ for someone smelled smoke near the Crypto room. It turned out to be some hot wires, but no fire. That was the fastest I ever seen GQ manned ever. George and I went back to the shop and I opened my letter from my wife. We had found out just before I left on this cruise that she was pregnant with our first child. In that letter that I opened she wrote to me to tell me that she had a miscarriage. I dropped the letter and ran up and out to the fantail. I sat down and cried uncontrollably there in the dark. The contents of the letter and the events of that day had taken its toll on me and I needed to release my feelings. George came looking for me for he knew something was wrong. I told him what was going on and he put his arm around me and gave me comfort. I felt closer to George then, than I had ever felt with my own brothers. I was aboard the LT for both of the Westpac cruises in 1970 and 1972. I had come aboard from a very similar ship called the James C. Owens, which I had picked up at Key West a few months after graduating from "A" school for Quartermasters in Newport, RI. It seems to me that I was on the mess deck for a very long time on both ships. I transferred from the JC to the LT in Mexico or very early in Pearl. During the first Westpac, as we all know, the horrible tragedy of the gunmount explosion occurred. With the passage of time and the loss of others in my life, I now very deeply feel that the loss we endured was nothing compared to the loss that the parents of these young men must have felt. The explosion itself, to me, was just a bit louder round. I was on the bridge when it happened, as we QM's, along with most of the ship were in "port" and "starboard" duty sections while firing NGFS. I think that I remember hearing the gun barrel "whooshing" through the air as it was blown free of the mount. I remember that everything seemed to be going in extremely slow motion as the adrenaline kicked in. The handling room and other areas were burning, but Captain Brown made the decision not to flood the magazine. The DC teams got the fires under control. Power was restored. Damage assessed. Time moved into fast forward. The dead and wounded were removed from the ship via helo. Plans were made for repairs to be undertaken. We steamed from the gunline toward Subic. During that time, as I recall, the temperature of the air never varied by more than a few degrees. While there was no rain, the horizon and the sky blended together, in a very weird and rare calm sea state. There were no waves. There were only muffled sounds. There was no sun, no stars, and very little talking. I remember that the gunmount was swung at a slight angle to starboard. I could see that the door on the mount was open. There were several streamers of blood flowing from the door area, down the side of the mount. It was almost as if the sea was trying to calm and bolster the officers and crew of the LT by providing a very somber, muffled, unusual environment. We arrived in Subic, the mount was removed, and those of us with liberty got roaring drunk. 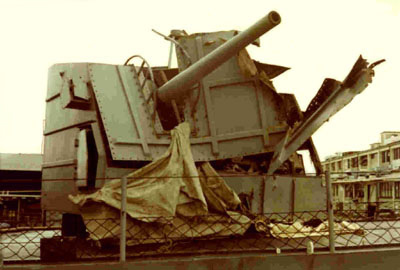 Eventually, we ended up with the forward gunmount from the Evans, which had been cut in two and destroyed by the HMS Melbourne. The Melbourne would nearly repeat that action with the LT later during the second Westpac cruise, but that is a story for another time. ...and we will never forget.